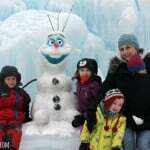 Are you going on a road trip with the kids this Summer? Have a week at the cabin planned? Maybe you just have bored kids. Whatever the reason, these DIY Road Trip Kits for kids are sure to beat any boredom and make car time fun! These kits are the perfect surprise to add to your next vacation. I’ve got great ideas for ages baby, 2 years, 4 years and 6 years along with some easy car snack ideas. We have a week away at our cabin planned this month which means no electronics and nothing but fun on the agenda. I created these kits for the kids to entertain them during our week away. They can’t wait to open them up and play with them! It’s fun to have something new that they don’t normally get to play with. The key to creating kits that will entertain them in the car is to keep them separate from their normal toys so the kits are a special, exciting thing to take out. Be sure to pin this for later so you can find it when you need it! To create your own DIY Road Trip kit you will first need a container to store it in. This Flip Top Organizing Bin from Thirty One is the perfect solution. It can be buckled in in the seat next to your child and filled with clothes, snacks or toys while traveling. The lid flips upside down for use as a wipe-able tray or game surface. Outer mesh pockets store items for quick access. They are also the perfect size to fit puzzles and activities. Then flip the lid and use as a tray! Travel with baby can be fun! Brady is 4 months old and he travels so well. He is starting to get interactive and play with his toys and it is so much fun watching him explore the world around him. Nuby Plush Character Pacifinder: Attach baby’s pacifier to the Pacifinder and clip it to their shirt or seat so it’s always easily in reach and doesn’t get lost in the car. IcyBite Teether Keys & All Natural Pacifier & Teether Wipes Set: This fun key set teether is filled with pûrICE Gel which stays cooler longer compared to water filled soothers. It’s also easy for baby to hold and is Endorsed by Pediatric Dentist and Orthodontist Dr. Grace Yum. The Pacifier & Teether Wipes are a must have! They are vanilla milk scented wipes and they naturally clean pacifiers, teethers, bottles, cups & toys. Now the next time your baby tosses their binky on the restaurant floor you can just use a wipe to clean it! No soapy residue left behind and they are all natural. Nuby Squeeze n’ Squeak: This cute toy is easy for baby to hold and play with. It squeaks and multiple textured surfaces. Brady loves it and I love how soft it is! FLOPPERS: A teether and toy in one! This is Brady’s favorite toy. There are multiple teething surfaces that he loves to gum and it’s easy for him to hold on to. Nuby Easy-Grip 3 Stage Feeding System (pictured inside the bottle holder attached to car seat): This feeding system goes from bottle to cup to soft silicone spout, then a Sport Sipper straw with a unique contour shape that easily fits their small hands. 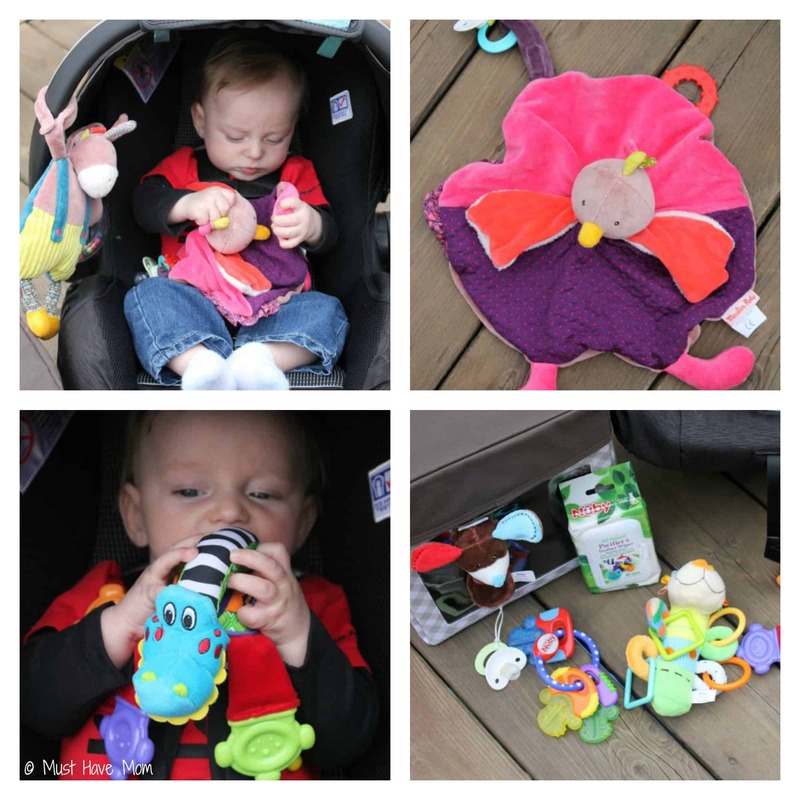 The Infantino Neoprene Necessities line is perfect for on the go with baby. Check out the whole line and enter my giveaway for it here. Magic Forest Hen Lovey: Brady loves his Hen Lovey (pictured above in top 2 photos)! Mother Hen is wrapped in softness but her rubber teething half-ring is meant to wean baby off a pacifier or aid soothing when teething. Mother Hen will watch over baby when mom attaches the small Velcro strap to baby’s pacifier, car seat or stroller. It’s soft and cuddly which is perfect for my blankie loving baby. Magic Forest Activity Donkey: (pictured hanging on car seat): Monsieur Potiron holds a rattle and many surprises for baby to discover from crinkly paper in his ears to textured fabric including corduroy. 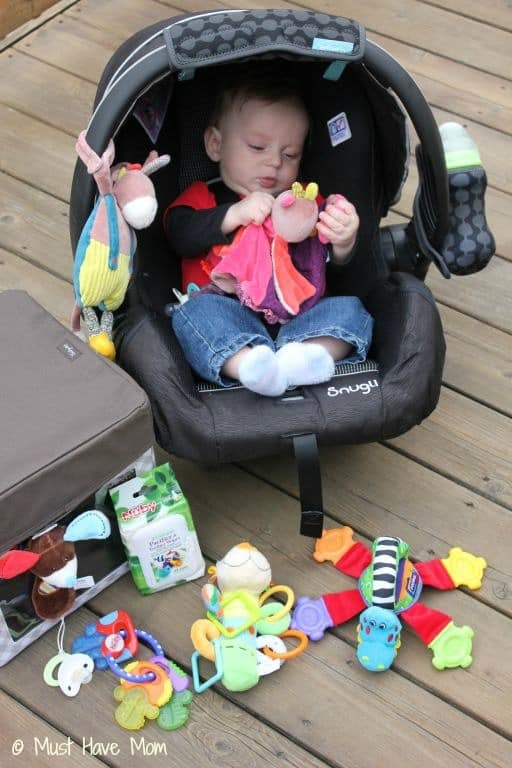 Hang Donkey by the hook to a stroller, car seat or crib. Or baby can grasp this perky-eared buddy in his tiny hands for a close encounter that soothes while entertains. Brady loves to play with the Activity Donkey in the car. It keeps him entertained while on the go! Innovative Kids To The Rescue Puzzle: This chunky foam puzzle is the perfect size for little hands and the pieces store right in the board making it ideal for road travel. Spark & Spark Snack Bowls: Create a personalized snack bowl for your child with these adorable snack bowls from Spark & Spark! Pick your design, personalize the design to match your child’s features and put their name on it. It’s perfect for easy snacks in the car. Our favorite is Cheez-Its! Innovative Kids Truck Puzzle Set: This adorable set includes four chunky 12-piece puzzles stored in a wooden carry-along box. Kids can build the puzzle right on the slide-open box lid, and then store the pieces back inside the box. Perfect for travel and on-the-go fun! 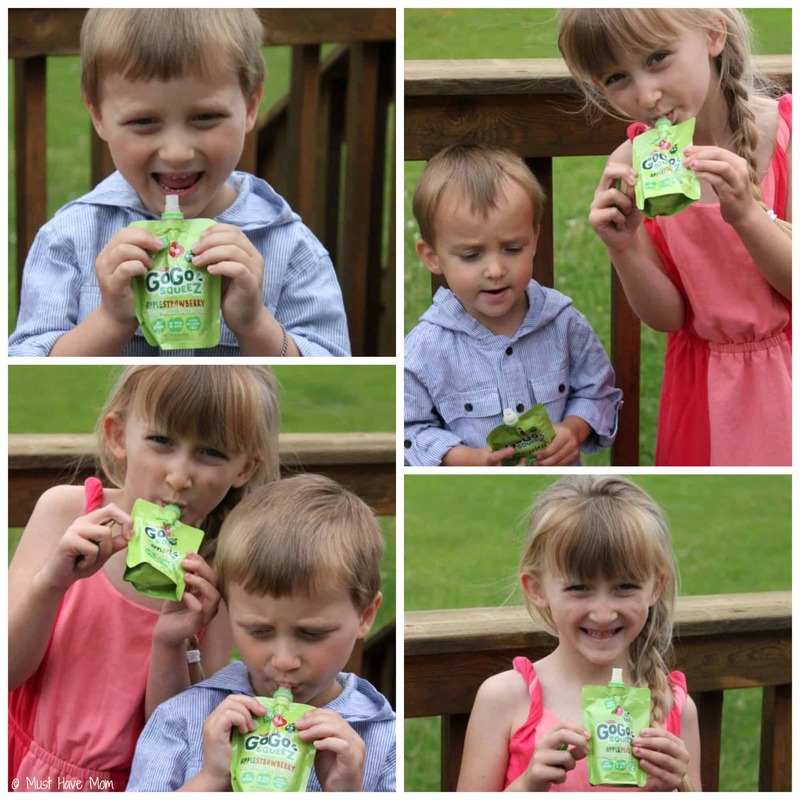 GoGo Squeez Applesauce Pouches: The perfect way to eat applesauce on the go! These are a great mess-free way to snack in the car. My four year old Aiden is an explorer and loves to learn about new things. I designed his kit to cater to his little preschool mind which is inquisitive and thirsting for knowledge. Spark & Spark Snack Bowl: Filled to the brim with Cheez-Its for my little snack monster! I personalized the Fast Race snack bowl with his name. He loves the race car themed bowl since he loves racing so much! Imagine I Can Character Mix Up: There are endless combinations of characters and creatures with 101 magnetized pieces and 4 paper background scenes. Kids simply place a background scene on the inside of their tin box and then ponder over which magnetic piece to add to the scene. Imagine that! Because it’s portable, the game can be played at the kitchen table, in the car or on a long plane ride. When play is done, pack everything back into the sturdy case. My kids LOVE the magnets and all the characters they can create. I love that their little imaginations are busy at work too! Play Draw Create Drawing & Magnet Dinosaurs: Travel back in time over and over again! With dino digs, prehistoric puzzles, dino-finding fun, and step-by-step how-to-draws, kids will dig right into this jam-packed dinousaur adventure. Play, draw, create with this reuseable, magnectic, write-on/wipe-off kit. 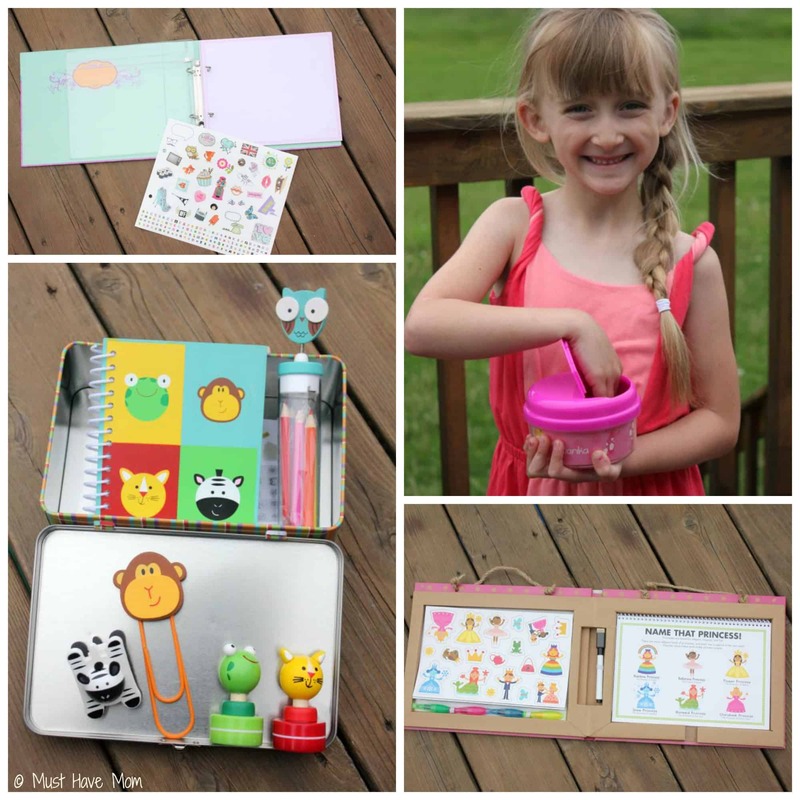 This tote-along package is great for at home or on-the-go fun and learning! They can use it right on their lap in the car. I love that the marker is a dry erase so he can do the activity over and over again! He loves that he can have so much fun while sitting in his car seat! Play Mats Animals: Explore the deep blue sea! Go on an African safari! Discover an animal that’s never been seen before! Perfect for mealtime or anytime, this amazing playmat pad includes a variety of unique, open-ended activities for fun at home or on the go. With how-to-draws, coloring, picture patterns, drawing prompts, and much more, kids will bring their own creative touch to these jam-packed animal adventure playmats! The built-in handle makes it easy for kids to get creative anytime, anywhere! These are not only ideal for use in the car, but they are also perfect to bring in to the restaurant. Kids stay entertained and occupied the whole time! 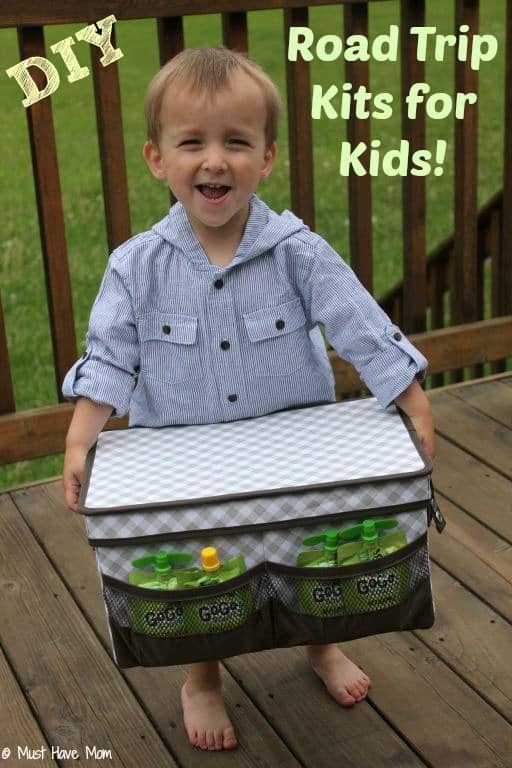 GoGo Squeez Pouches: Aiden loves the organic applesauce flavor. I love that they don’t make a mess in the car! Danika is 6 years old and always wants to learn everything about the world around her. She is also very artistic and you can usually find her creating a masterpiece out of paper, stickers and scissors. My tape is always missing and there is always paper scattered over my floor. I love her creative streak. I created this kit to cater to that. Play Draw Create Princesses: Create an enchanted world or make up your own princess adventures! Play, draw, create with this reusable, magnetic, write-on/wipe-off kit. 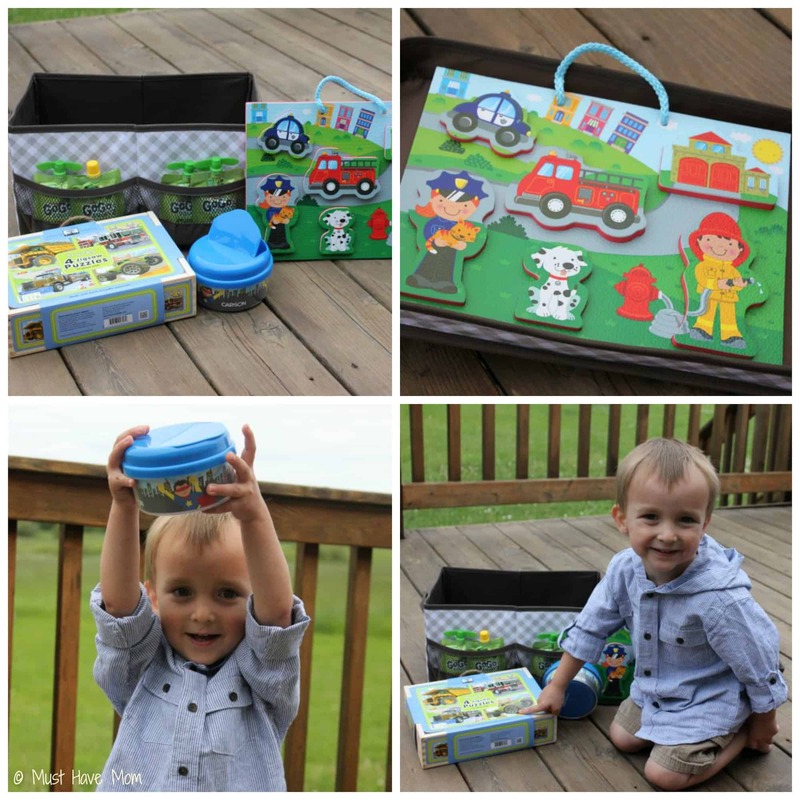 This tote-along package is great for at home or on-the-go fun and learning! Sugar Lulu Sticker Album: Sticker collecting is back! Hooray for that! I loved collecting stickers as a young girl and my daughter is no different. She is always looking for a place to put her stickers and now with the Sugar Lulu Sticker Album we have just what she needs! Collect and trade all your stickers in one perfect place! With 10 reusable sheets, a cool zipper pouch to hold any loose stickers, and over 50 one-of-a-kind stickers to start your collection, you will love collecting and trading stickers with this refillable, reusable, and ridiculously awesome album. Includes letter stickers and a place to personalize with your name! Imagine I Can Notes N’ Stuff: This stationery set has everything you need for hours of fun creating notes n’ stuff. Tin storage case with wooden handle keeps stationery items organized and easy to take with you wherever you go. Kit contains: 1 spiral notebook with wood cover, 6 color pencils, 1 pencil sharpener, 1 pencil topper,1 magnetic clip and 2 self-inking stamps. This is the perfect kit for every little girl. They love creating notes and doodling and they can do that and more with this kit. Love For Ballet Snack Bowl: I personalized the Spark & Spark Love for Ballet snack bowl with Danika’s name and features. She loves the pink color and adorable ballerina design. It’s perfect for keeping snacks stowed and keeping them from spilling while still being easily accessible. GoGo Squeez: Danika’s favorite flavor is Cinnamon Applesauce. She is the biggest GoGo Squeez fan that I know. She loves all the flavors! I love that they are a healthy snack on the go. When traveling in the car be sure to bring along lots of mess-free, healthy snacks for the kids. We try to avoid drinking lots of liquids to cut down on bathroom breaks but we make sure to have plenty of snacks on hand. GoGo Squeez applesauce pouches are one of our favorite road trip snacks. They are a healthy option that the kids can eat without making a mess. Plus they come in lots of great flavors like Apple Strawberry and Apple Mango! Another favorite snack as I mentioned is baked cheese crackers, fruit snacks, dry cereal, raisins, trail mix and granola bars. The Spark & Spark personalized snack bowls are perfect for keeping the kids snacks fresh and sealed while still having easy access for snacking when needed. Plus, since they are personalized you will know which bowl belongs to which child so no fighting will erupt! Check out these playful ways to make your road trip a blast! You can buy all of these products at retailers near you or online! 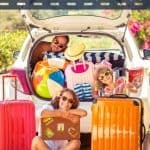 What will you pack in your child’s Road Trip kit? Which product is your favorite? 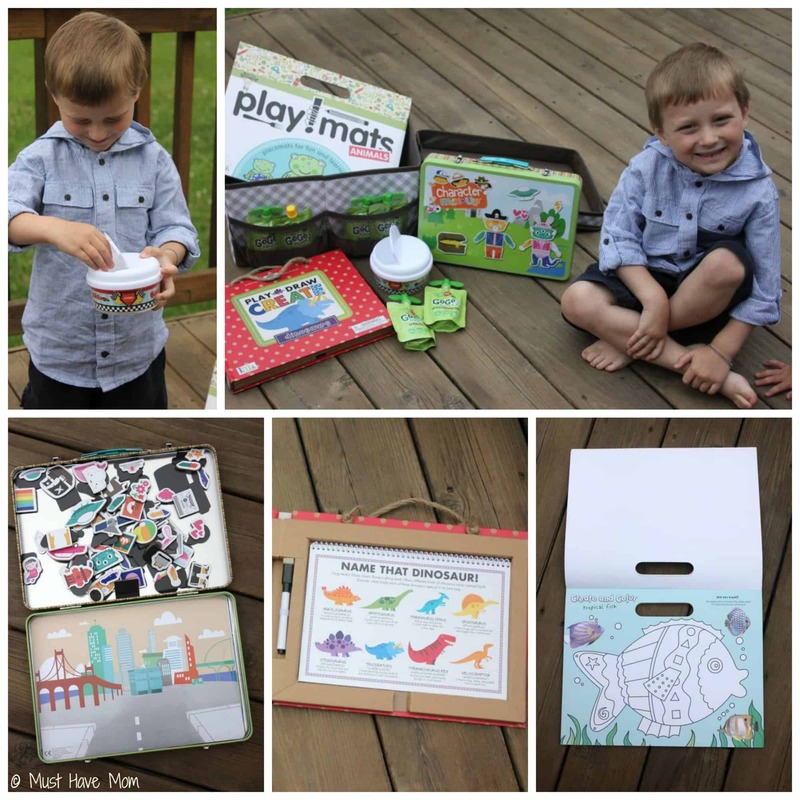 Create a kit that caters to your child’s interests and will keep them occupied on your trip! I like the Imagine I Can Notes N’ Stuff. I love the flopper! Such a cute toy! My favorite is the IcyBite Teether Keys & All Natural Pacifier & Teether Wipes Set. 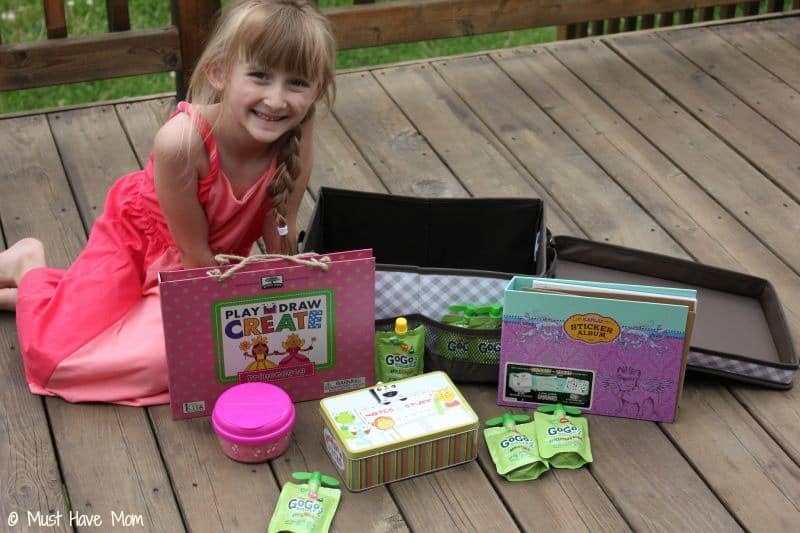 How totally cute your pics are 😉 These are fantastic ideas for travel kits for the little ones! So clever & creative! Love all the great ideas. Don’t laugh but my favorite thing is probably the GoGoSqueeze. My kids love that stuff and it’s a far better solution that chips, cookies or other snacks you might pick up along the way during gas fill-ups! I love the Imagine I Can Character Mix Up and the Animal play mats! My daughter would love them in the car and on the plane! Great kit! We always pack those go go squeezes as road trip snacks. Awesome kit! Loving the photos! What a great road trip kit! Thanks for sharing. Your photos are so cute. Gret kit! That’s a wonderful way to keep things together and organized and easy to find! We use backpacks. Each kid has there own, and they are used exclusively for travelling. 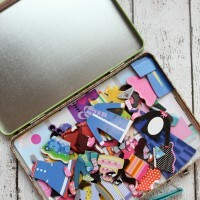 You can’t organize quite as well in them, but they are very easy for the kids to carry around. The Nuby Easy-Grip 3 Stage Feeding System is my favorite. I like the play draw create princesses! I love the Nuby Easy-Grip 3 Stage Feeding System. I love that one product changes into so many! Love the to the rescue puzzle! The Imagine I can Notes & Stuff. My favorite is the Play Draw Create Princesses. Thanks.